The Tensor fascia latae(TFL) is a fusiform muscle enclosed between two layers of fascia lata with a length of 15cm approximately and overlying the gluteus minimus and some part of the gluteus medius. It's myotomes is fourth lumbar nerve root (L4). The iliotibial band is a 5 cm wide band called that divides into two layers superiorly and a single tract inferiorly. The superficial part is attached to the tubercle of the iliac crest, and the deep lamina to the capsule of the hip joint. The superior gluteal vien a branch of the internal iliac viens serves as the venous drainage route. 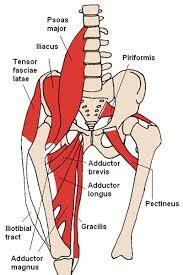 As part of the iliotibial tract it aids lateral rotation of the leg. TFL also assist in walking by inferiorly tilting the ilium on the weight-bearing side, with resultan a upward tilt of the contralateral hip. Thus, allowing the leg of the non weight bearing hip to swing through without hitting the ground during the swing phase of the gait. The power test for the TFL is done in side lying with hip in 45° of flexion for grade 5, 4 and 3 while for grade 2, 1 and 0, it is done in long sitting position. The therapist is situated behind the patient with one hand is placed at the lateral surfece of the topmost thigh immediately above the knee, given downwards pressure and the other hand at the iliac crest for stability. the patient is asked to abduct against resistance. Grade 5 is given if the patient is able to abduct and maintain position at end range against maximal resistance. Grade 4 is given if the patient is able to abduct and maintain position at end range against moderate resistance. Grade 3 is given if the patient is able to abduct and maintain position at end range against no resistance except gravity. The therapist stands at the side of the limb being assessed one hand is place at the ankle serving to reduced friction between the limb and the plinth while the other hand is placed at the proximal anterolateral thigh. The patient is asked to move the limb towards the therapist. Grade 3 is given if the patient is able to abduct to 30° and maintain position at end range. For grade 1 and 0, the starting position is the same for grade 3 assessment but the hand placement of the therapist changes;one hand is placed at the the lateral side of the thigh immediately above the knee while the other hand is placed at the proximal anterolateral thigh for ease of TFL palpation.The patient is asked to move the limb towards the therapist. Grade 1 is given if therapist is able to feel contraction of the muscle and grade 0 is given if no contraction is palpable. Palpation of TFL can be done in any of the aforementioned starting position in muscle power testing. One hand is placed at the the lateral side of the thigh immediately above the knee while the other hand is placed at the proximal anterolateral thigh and the patient is instructed to abduct(move the limb being tested away from the contralateral limb) the limb being assessed. TFL can then be easily palpable at end range of the motion. The TFL muscle is about 15cm in length.